In this post, we will discuss the SQL Server lock mechanism and how to monitor SQL Server locking with SQL Server standard dynamic management views. Before we start to explain SQL Server lock architecture, let’s take a moment to describe what the ACID (Atomicity, Consistency, Isolation, and Durability) database is. The ACID database can be explained as database theory. If a database is called relational database, it has to meet Atomicity, Consistency, Isolation, and Durability requirements. Now, we will explain these requirements briefly. Atomicity: It reflects the principle of indivisibility that we describe as the main feature of the transaction process. A transaction block cannot be left unattended. Half of the remaining transaction block causes data inconsistency. Either the entire transaction is performed or the transaction returns to the beginning. That is, all changes made by the transaction are undone and returned to their previous state. Consistency: There is a rule that sets the substructure of the non-divisibility rule. Transaction data must provide consistency. That is, if the update operation is performed in a transaction, either all remaining transactions must be performed or the update operation must be canceled. This data is very important in terms of consistency. Isolation: This is a request packet for each transaction database. Changes made by a request packet must be visible to another transaction before it is complete. Each transaction must be processed separately. All transactions must be visible to another transaction after they occur. Durability: Transactions can perform complex operations with data. In order to secure all these transactions, they must be resistant to a transaction error. 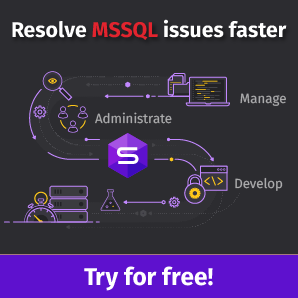 System problems that may occur in SQL Server should be prepared and resilient against power failure, operating system or other software-induced errors. Transaction: Transaction is the smallest stack of the process which cannot be divided into smaller pieces. Also, some group of transaction process can be performed sequentially but as we explained in the Atomicity principle if even one of the transactions fails, all transaction blocks will fail. Lock hierarchy: SQL Server has a lock hierarchy which acquires lock objects in this hierarchy. A database is located at the top of the hierarchy and row is located at the bottom. The below image illustrates the lock hierarchy of SQL Server. Shared (S) Locks: This lock type occurs when the object needs to be read. This lock type does not cause much problem. Exclusive (X) Locks: When this lock type occurs, it occurs to prevent other transactions to modify or access a locked object. Update (U) Locks: This lock type is similar to the exclusive lock but it has some differences. We can divide the update operation into different phases: read phase and write phase. During the read phase, SQL Server does not want other transactions to have access to this object to be changed. For this reason, SQL Server uses the update lock. Intent Locks: The intent lock occurs when SQL Server wants to acquire the shared (S) lock or exclusive (X) lock on some of the resources lower in the lock hierarchy. In practice, when SQL Server acquires a lock on a page or row, the intent lock is required in the table. After all these brief explanations, we will try to find an answer to how to identify locks. SQL Server offers a lot of dynamic management views to access metrics. 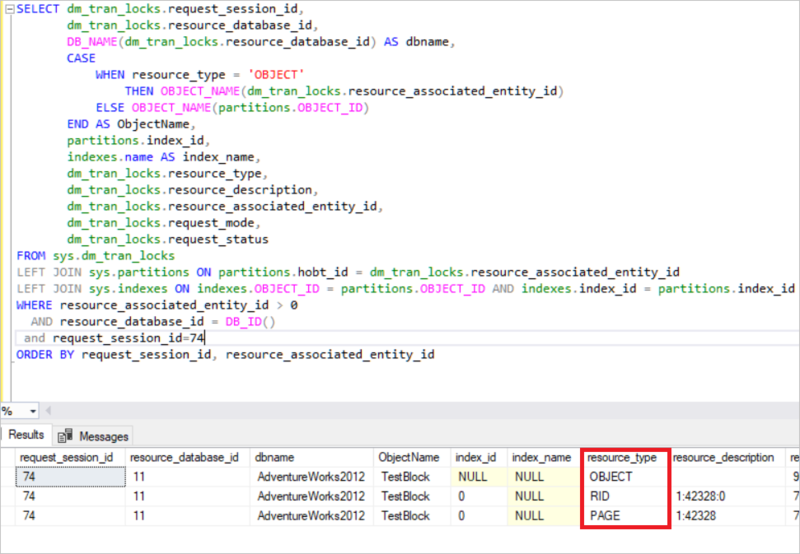 To identify SQL Server locks, we can use the sys.dm_tran_locks view. In this view, we can find a lot of information about currently active lock manager resources. In the first example, we will create a demo table which does not include any indexes and try to update this demo table. In this step, we will create an open transaction and analyze the locked resources. Now, we will check the sys.dm_tran_lock view. This view returns a lot of information about active lock resources. But it is not possible to understand some of the data in this view. For this reason, we have to join the sys.dm_tran_locks view to other views. In the above image, you can see the locked resources. SQL Server acquires the exclusive lock in that row. 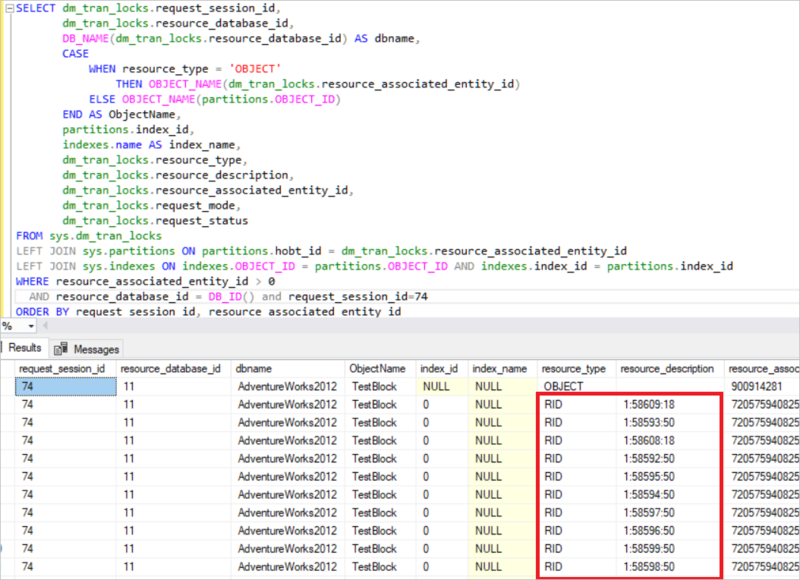 (RID: A row identifier used to lock a single row within a heap) At the same time, SQL Server acquires the intent exclusive lock in the page and the TestBlock table. It means that any other process cannot read this resource until the SQL Server releases the locks. 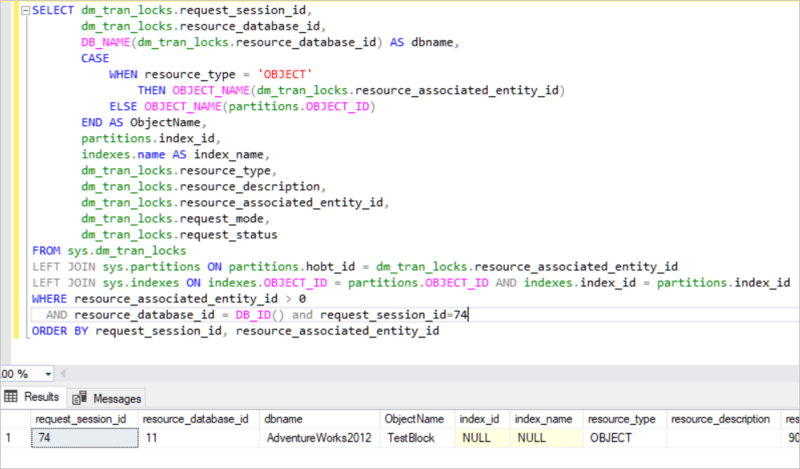 This is the basic lock mechanism in the SQL Server. Now, we will populate some synthetic data on our test table. After completing this step, we will run two queries and check the sys.dm_tran_locks view. 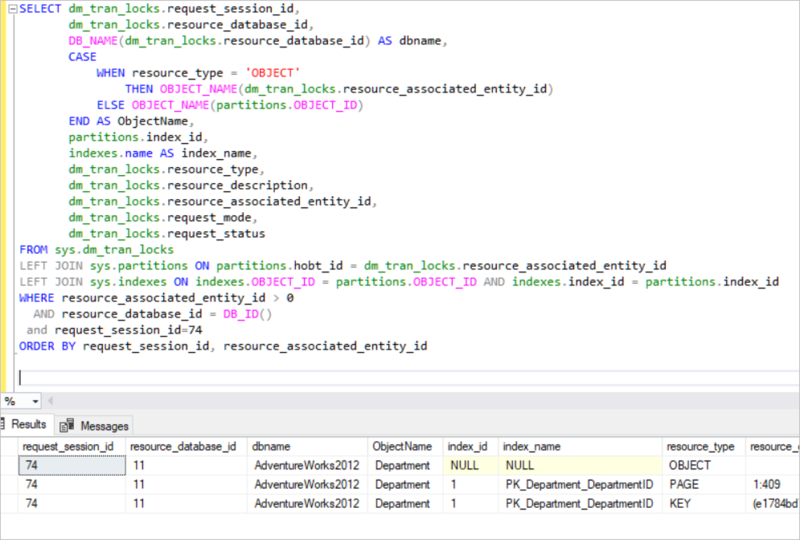 In the above query, SQL Server acquires the exclusive lock on every single row. Now, we will run another query. In the above query, SQL Server creates the exclusive lock on the table, Because SQL Server tries to acquire a lot of RID locks for these rows which will be updated. This case causes a lot of resource consumption in the database engine. Therefore, SQL Server automatically moves this exclusive lock to an up-level object which is in the lock hierarchy. We define this mechanism as Lock Escalation. Lock Escalation can be changed at the table level. I would like to add some notes about lock escalation. If you have a partitioned table, then we can set the escalation to the partition level. In this step, we will execute a query which creates a lock in the AdventureWorks HumanResources table. This table has clustered and non-clustered indexes. The Name column is indexed in the AK_Department_Name non-clustered index and we try to change the Name column. In this case, SQL Server needs to change any non-clustered indexes on that column. The non-clustered index leaf level includes every KEY value sorted out. In this article, we mentioned the main lines of SQL Server lock mechanism and considered the use of sys.dm_tran_locks. The sys.dm_tran_locks view returns a lot of information about currently active lock resources. If you google, you can find a lot of sample queries about this view.